Rep. Jeff Denham, R-Calif., left, speaks next to Rep. David Valadao, R-Calif., and Rep. Will Hurd, R-Texas, during a news conference with House Republicans who are collecting signatures on a petition to force House votes on immigration legislation on Capitol Hill in Washington, May 9, 2018. Young undocumented immigrants seeking permanent status in the United States received an unexpected boost Thursday on Capitol Hill as a small group of House Republicans mounted a last-minute effort to bring up an immigration vote in Congress. The group of eight Republicans — some freed from political considerations by upcoming retirements and others facing tough re-elections races — defied their own party leadership, quickly persuading 10 more Republicans to sign on to a petition that would force debate on the Deferred Action for Childhood Arrivals (DACA) program. With all 193 Democrats expected to sign on, Republicans will have to persuade just seven more members of their own party to join the petition to trigger a vote on several immigration bills on the House floor. But Republican leadership said the effort would be wasted if the end result is a presidential veto. "I think it's important for us to come up with a solution that the president can support," House Speaker Paul Ryan told reporters Thursday. These types of petitions are rare and seen as a threat to leadership's ability to direct legislative action. Speaker of the House Paul Ryan, R-Wis., meets with reporters during his weekly news conference on Capitol Hill in Washington, May 10, 2018. "It's better to use the legislative process," Republican Majority Leader Kevin McCarthy told reporters Wednesday. But that argument appears to be losing sway with House members who see an opportunity for legislative action in a mid-term election year. 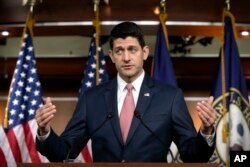 The growing group of House Republicans are joining Democratic colleagues who have long criticized Ryan for not bringing immigration bills up for a vote. "This is about making sure we're not consolidating power in the White House," said Representative Mia Love, a Republican from Utah and one of the first lawmakers to sign petition. The immigration issue had all but died after an effort to pass a DACA fix collapsed in the U.S. Senate earlier this year. The program has been the focus of fierce negotiations on Capitol Hill since last September, when President Donald Trump announced he was ending the 2012 Obama-era program and called for a legislative fix. The DACA program has shielded from deportation about 800,000 undocumented people who were brought to the United States illegally as children, mainly from Mexico and Central America. The U.S. Supreme Court gave DACA recipients a reprieve this spring when it declined to hear an appeal of several lower court rulings to maintain the program. 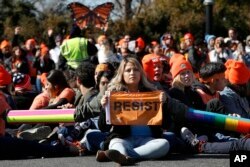 FILE - A woman holds up a sign that says, "resist," as supporters of the Deferred Action for Childhood Arrivals (DACA) block an intersection near the U.S. Capitol in support of DACA recipients on Capitol Hill in Washington, March 5, 2018. "The pressure point went away after the Supreme Court didn't act — and I was happy that it gave more time to DACA recipients, but it took the pressure off here," Representative Mario Diaz-Balart, a Republican from Florida, told VOA. "This is a way to bring it back. So this is very unique opportunity," he said. The lawmakers are pressing for a vote on a range of Republican, Democratic and bipartisan solutions to the status of DACA recipients, in addition to addressing concerns about border security and visa programs. If the petition succeeds, the earliest the House could enter into debate on the bills would be in mid-June. Under the rules of the so-called "Queen of the Hill" process, the bill with the most votes would be sent to the Senate. "We believe that there's going to be opportunities for members of all the different caucuses on the left and the right to vote on the bills they think are important — but the important thing is to have a full debate here," said Representative Jeff Denham, a Republican from California who is leading the effort. Several states have filed lawsuits against the DACA program. Those cases are expected to work their way up to the U.S. Supreme Court this summer.